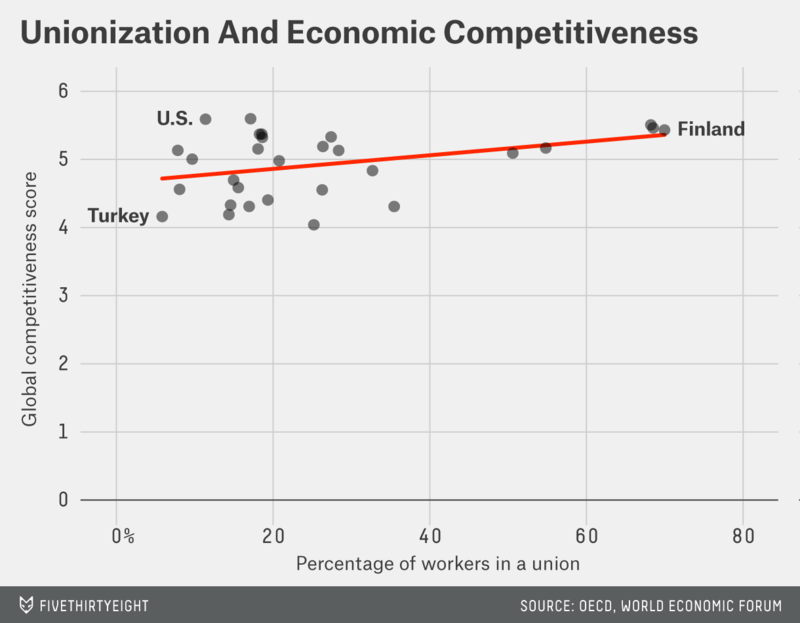 Do Fewer Unions Make Countries More Competitive? Protesters march during a May Day rally in central Stockholm, Sweden, on May 1, 2012. Thursday is May Day, also known as International Workers’ Day, a celebration of the international labor movement. Unionization rates have been falling in developing countries for 50 years — from 34 percent of workers in 1960 to 17 percent in 2012, according to the Organization for Economic Co-Operation and Development (OECD), a club made up of 34 mostly rich countries. In the United States, as of 2013 only 11.3 percent of workers were unionized, down from 20 percent two decades earlier. The effect of unionization on a country’s economic competitiveness is of great interest to — and controversy among — economists. Are countries with higher rates of unionization more or less economically competitive? We can take a first look by comparing measures of unionized workers in developed countries against a measure of those countries’ competitiveness. Using data from the OECD, we can measure the share of wage- and salary-earners who are members of a trade union in a given country, also known as the rate of trade union density. Northern European countries like Denmark, Sweden and Finland have very high rates of unionization (nearly 70 percent), while the United States, Korea and Turkey have much lower union density. I compared these cross-country rates to the World Economic Forum’s annual Global Competitiveness Index. The GCI defines competitiveness as “the set of institutions, policies, and factors that determine the level of productivity of a country,” and calculates a score based on survey responses from business executives as well as statistical indicators covering macroeconomics, education and health. The chart below plots unionization density rates from 2010, the most recent year we have comprehensive data available, against the 2010 GCI scores for 29 of the 33 OECD countries that year (the Czech Republic, Iceland, Hungary and Luxembourg did not have data available). In 2010, Switzerland was ranked No. 1 in competitiveness, while the United States was No. 2. It seems that countries with higher rates of unionization density are slightly more economically competitive. Based on a simple regression, the relationship is significant, but the effect is extremely small. Of course, there are many other variables at play not captured in this simple data analysis. The numbers are not weighted by country population — so Sweden (population 9.5 million) and the United States (population 314 million), both scoring high in economic competitiveness but varying dramatically in unionization, are weighted equally. Unfortunately, the OECD trade-union data limits our examination to mostly developed, Western countries because it doesn’t cover every country with a GCI score. For example, Singapore, which in the 2014 GCI ranks as the second-most competitive country, is not in the OECD.